In an age where humans can jet across continents and oceans, oblivious to the forces that lie below us, it feels a little frustrating to be marooned in sea ice, unable to move forward and, at this stage, with little prospect of moving backwards. However, as the days pass, that is what everyone aboard the Xue Long must accept. Antarctica still makes the rules. This is what fascinates many of us who choose to come here. Of course we know that the ice will eventually break up and release the ship from its grip - perhaps a few more days, perhaps a week, perhaps several weeks. But time is running out, and this inevitably raises questions about the feasibility of completing the first phase of Kunlun station at Dome A this austral summer. With the situation unresolved, it's a relief when I am told that I will be transferred to Zhongshan Station by helicopter in the afternoon. On arrival, I am struck by the buzz of activity in and around the station. Most visible are the construction teams that were transferred from the ship some ten days ago and that are now working round the clock, in shifts, building the frames for the new buildings (with beams brought over last year). This also means that the station's usual sixty-person capacity is being stretched to the limit, with two women and more than seventy men currently staying here. At Zhongshan, the old is very worn, and the new will be very modern. Both have their place, but I immediately feel at home in the warm atmosphere and charm of the old station. Many of the people who have worked and lived here, often through the winter, tell me that they will miss it. 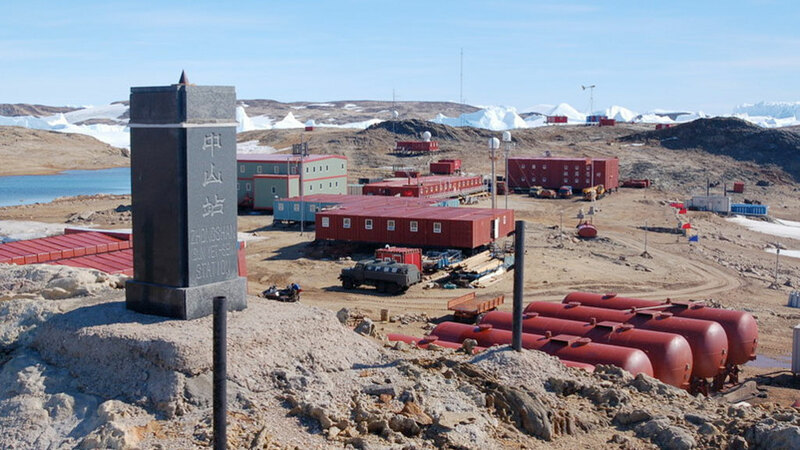 But there is talk of keeping the main building as a monument to the early days of the Chinese Antarctic programme (much like the New Zealanders have done with the early buildings of the Scott Base, built by Sir Edmund Hillary during the IGY). Zhongshan Station is located in the ice-free Larsemann Hills, in the Prydz Bay region of East Antarctica (at 69°22'44"S 76°22'40"E), just a few kilometres from the Russian station, Progress II. Discovered by Norwegian Whalers in 1934-35, the Larsemann Hills consist of a narrow band of parallel peninsulas stuck between the ice sheet and the ocean. An amazing ice-free lakeland in the summer months, the peninsulas belong to the two percent of Antarctica not covered by ice sheets and glaciers. Like Zhongshan, Progress II is also in the midst of a multi-year construction project that will make it Russia's largest Antarctic station. Part of the plan is to use it as the coastal support station for the legendary Vostok Station (1,200 kilometres inland), as well as for future research and drilling into the Vostok sub-glacial lake. In early October, Progress II's existing main building caught fire and burned to the ground, killing one man and seriously injuring two others. Whilst waiting for the arrival of support flights and of the relief ship in the second half of December, Akademik Federov and the wintering crew have been living in various smaller and older buildings, as well as in parts of the first new building nearing completion. Zhongshan Station provided support after the fire, taking in the two wounded men and establishing radio contact with Russia after the fire destroyed communications equipment. As part of its own construction and renovation programme, Zhongshan Station will see the addition of six new buildings over the next 18 months, extending the existing floor surface area by 3,800 square metres. Designed by the Architectural Institute at Qinghua University in Beijing, these will include a main building that will include: offices, labs, leisure spaces, a kitchen and a dining area; an extensive new garage and mechanical building; a multi-purpose storage building; a water treatment and waste disposal building; a high-frequency radar operation building; and a new building dedicated to atmospheric physics. The meteorological observation building will be preserved and continue to operate as is. A host of other newer science buildings will be dedicated to environmental monitoring. The station will continue to be powered by oil generators and receive its water supply from two freshwater lakes behind the station. Thanks to the new water treatment plant, all dirty grey water (and not just part, as is currently the case) will be treated before being released into the sea. Once this major phase of work is completed in the 2009-10 summer season, the next phase of construction is to include a new power plant, new fuel storage tanks, and a larger sleeping accommodations building. Also under consideration are a range of renewable energy sources such as solar and wind power, with Zhongshan's location between the ice sheet and the sea being particularly promising for wind turbines. As well as extending its own scientific research capacity, Zhongshan is also set to become a logistical support platform for Dome A's Kunlun Station once it is constructed and operational. In this dual role, Zhongshan will resemble the US's McMurdo Station, France's Dumont d'Urville Station and Russia's Progress II station, all of which currently support (or will support) inland stations at the South Pole, Dome C, and Vostok respectively. Indeed, with the refurbishment and extension of both Zhongshan and Progress II Stations, the Larsemann Hills will become one of the busiest research and logistics areas in the whole of Antarctica, even as some people in the international polar research community quietly questioning the wisdom of India's project to add another station to the area. Plans for this new station are already drawn up and construction is set to start as early as next year. On arrival, I am struck by the buzz of activity in and around the station.